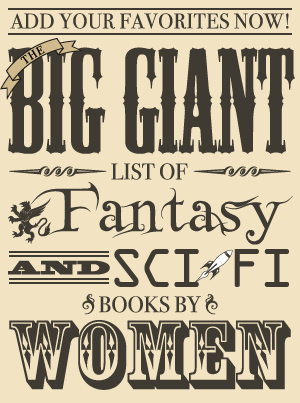 In 2013 we asked people to share the science fiction and fantasy books by women that they loved and help us create an expansive list of work for readers, especially readers looking to read women more widely and readers new to the genre. Then, in 2014, we figured there can never be too many books to read so we decided to keep doing it. This list a collection of people's submissions. The 2013 list was compiled with a simple Google docs form. Every person could submit up to ten books. Organization of the data for the list involved confirming single items and series. In 2014 we upgraded to a more structured database system that used Goodreads to help search for and standardize titles and series and have been using that system since. Each recommendation was counted, in order to show how many fans recommended a specific title received. In cases where entire series were nominated in the place of a single title, we assigned that vote to the first book in the series. We chose to do this in order to provide more guidance for people using the list as a place to start reading so they wouldn't pick up a book in the middle of a story line and accidentally get spoiled. When books in a series were recommended individually, those titles were retained. Approximately 2500 individual recommendations were received to the initial survey that this list represents.